After millennia of stagnation, why did the European economy explode in the 17th century into what economic historians call the hockey stick of per capita GDP? We know that Christianity had finally made an impact on envy; Christian individualism had broken out; modern science, created by Christian theologians, began to contribute; the Salamancan scholars persuaded people to respect commerce and protect property. Those are all necessary ingredients. Still, where did business people get the money to invest? Marx claimed that Europe stole it from the Americas when Spain began looting it colonies of gold and silver. But Spain never took part in the Industrial Revolution and declined in wealth and power throughout the 17th century. Europe lacked the wealth needed to ignite the revolution for two reasons. One was the conspicuous consumption of the nobility. They held to an economic principle that their spending benefitted the poor, so they were required to spend as much as possible on moral/economic grounds. Also, their status in the community required them to spend lavishly on houses and throw parties with great banquets. Had investing in business interested the nobility, which it didn’t, they would have had no savings to invest. What about rich merchants? The church had told them for 1,500 years that earning profits had condemned their souls to hell, so when merchants accumulated enough wealth they would buy titles of nobility and the land to go with them with half their wealth. That gave them the respect in society they had always craved and protected their wealth from theft by other nobility. The other half of their wealth they gave to the church in the hope of reducing the time they would spend in purgatory. Princeton professor Peter Brown shows in Through the Eye of a Needle: Wealth, the Fall of Rome, and the Making of Christianity in the West, 350-550 AD, that by 500 AD most Europeans thought that the rich had to give all of their wealth to the Church in order to get into heaven. So many among the nobility did just that. Often they would give all of their land to the Church, which would use the income to help the poor. Before the Reformation, the Catholic Church owned as much as a third of the land in Western Europe. For any economy to grow, the rich must invest in new businesses. That shows the God-given harmony of interests in free markets, as Bastiat wrote in his Harmonies of Political Economy. The poor need the rich to create jobs for them through investments. The rich need the poor to work in the businesses they create. But such investment didn’t happen before the Reformation. Then, Martin Luther and other Protestant Reformers insisted that people could achieve salvation only through faith. Giving to the Church or the poor were good works, but contributed nothing to getting into the Kingdom of God. So in countries that went Protestant, such as the Dutch Republic, wealthy merchants quit giving to the church except for a tithe of their income. They no longer needed to buy titles of nobility and land to protect their wealth because the state began doing its job of protecting those. And being a business person became respectable for the first time in Europe. So business people didn’t need titles of nobility to get respect. Successful manufacturers and merchants invested their wealth in new and expanding businesses. The demand for workers caused wages to soar and the use of mass production caused prices to fall. Standards of living began to rocket for the first time in European history. The Industrial Revolution began in the Dutch Republic, not England, according to Jonathan Israel in The Dutch Republic, Its Rise, Greatness, and Fall 1477-1806 and Jan de Vries in The First Modern Economy, Success, failure, and perseverance of the Dutch economy, 1500-1815. Much of the “steam” for England’s Industrial Revolution came from Dutch banks and wealthy investors. Max Weber got the origins of capital wrong, too, in his famous The Protestant Ethic and the Spirit of Capitalism. The only part he got right was to identify the contributions of Protestantism. 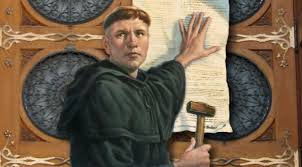 October 31 is not only the Christian holiday known as Halloween, it’s also Reformation Day, the day Martin Luther nailed his 95 theses to the Wittenberg Church door. The Industrial Revolution required massive amounts of wealth to invest in innovative technologies. The Protestant Reformation diverted the necessary wealth from the Church and financed that investment.